Hashtags are a very interesting topic lately. Some people love them, some people hate them, many are indifferent, and still others don’t really understand them. One thing is for certain though… they’ve become mainstream. Even non-Twitter users can’t get away from them. You see them on TV shows, news stories, print ads… almost everywhere these days. and several other smaller, lesser known networks. Okay, let’s get this one out of the way early… “random punchlines”. It’s common to see people using hashtags for this purpose when trying to be clever or funny. For example: #sotasty, #makingshithappen, #lovethisplace. These tags are basically useless because nobody else is tweeting in those channels, but they do help to get your point across. That said, there are some popular punchline hashtags that are used all the time, so there’s a constant stream of tweets in them. Examples: #FAIL, #YOLO, #FTW, #ICYMI. If you’re not sure what these mean, send me a note. I’ll fill you in. I try to avoid using punchline hashtags because I think they’re a waste of 140-character real estate, but sometimes I can’t resist. I do like to include a #Fail now and again, when I feel the need to complain about a company that has let me down. 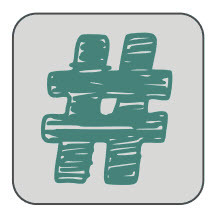 What are the GOOD uses of #hashtags? It is undeniable that hashtags are very useful for finding up-to-the-minute information on a particular topic. They’re great for finding and joining social conversations and communities, expanding your digital reach, and for building your brand. They’re a great source of focused and relevant information on a topic. They help to filter out the noise of random crap on Twitter. If used properly in your tweets, they help to expand your reach and grow your follower base faster. Which #hashtags do I follow? What hashtags do you personally find useful or interesting? Please suggest some good ones in the comments area!